Evergreen shrubs, as the name implies, remain green year-round, although there are a few varieties in shades of blue, brown and yellow. These shrubs add color and beauty even in winter. Evergreen shrubs are disease and drought resistant, which makes them an excellent choice for gardens across the United States from zones 2 to 9. 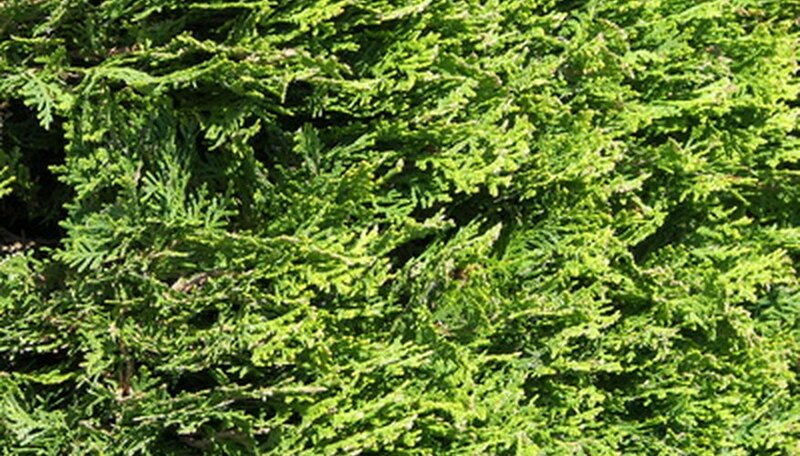 Some types of evergreen shrubs include boxwood and spruce. With just a little care and attention on your part, your evergreen shrubs will be healthy and thrive for many years. Prune the shrubs regularly to maintain their shape. Evergreens are available in a variety of natural shapes such as columnar, vase, round, upright, weeping, pyramidal and prostrate. Use sharp pruning scissors and conform to the particular shape. Keep in mind that dead or dying branches not only reduce the appearance of the shrub, but leach on nutrients meant for healthy branches. Dig a 4-inch deep hole in the ground around the evergreen shrub with a hand shovel and scoop out some soil. Send this soil sample in a container or zipper bag to your local landscape center or county extension office to determine the nutrient content. Feed the soil around the shrub bone meal if the soil lacks iron. Follow label directions prior to application. Water your evergreen shrubs regularly using a watering can or garden hose at medium setting. Although evergreens are naturally drought resistant, they benefit from frequent watering until the soil is evenly moist. Also water the evergreens frequently during periods of drought. Mulch the soil around the tree. Choose organic mulch such as compost, bark, straw, manure or cardboard and spread a 3-inch layer around the base. Mulch retains moisture, keeps the roots cool and prevents competing weeds from growing there. It also protects the shrubs from the buildup of ice in the winter. You can also add a 1- to 2-inch layer of rock chips or pine bark over the mulch for a decorative touch. Check the evergreen shrubs frequently for damage or disease, and cut off affected branches promptly to prevent spread. Evergreens are usually affected by blight, or black spots of fungal spores. Apply fungicide regularly, dispose the damaged branches appropriately and wash the shears thoroughly. The ideal time to prune your evergreen shrubs is in early spring, just after they end their dormancy period. Prune flowering evergreens after they flower. If growing evergreens in containers, make sure they have adequate drainage holes. Never prune more than one-third of the foliage of an evergreen shrub.